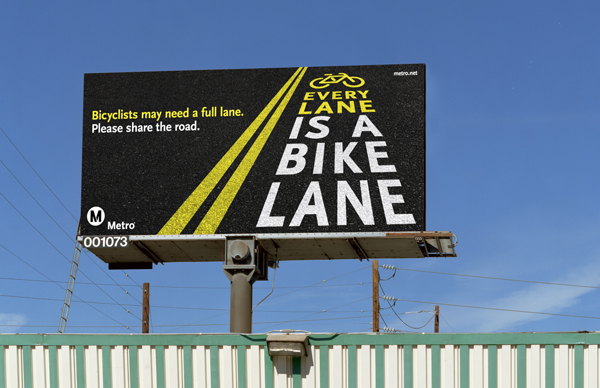 In the spirit of sharing the road, Metro launched the “Every lane is a bike lane” campaign in late March to increase motorists’ awareness of cyclists’ rights to the road. Not everyone—both motorists and cyclists—realizes that cyclists are allowed use of a full lane to safely navigate certain traffic situations. This includes keeping clear of cars turning right, doors opening on parallel parked cars, making a left-hand turn and riding on a narrow road. (Here is a helpful DMV guide for cyclists). 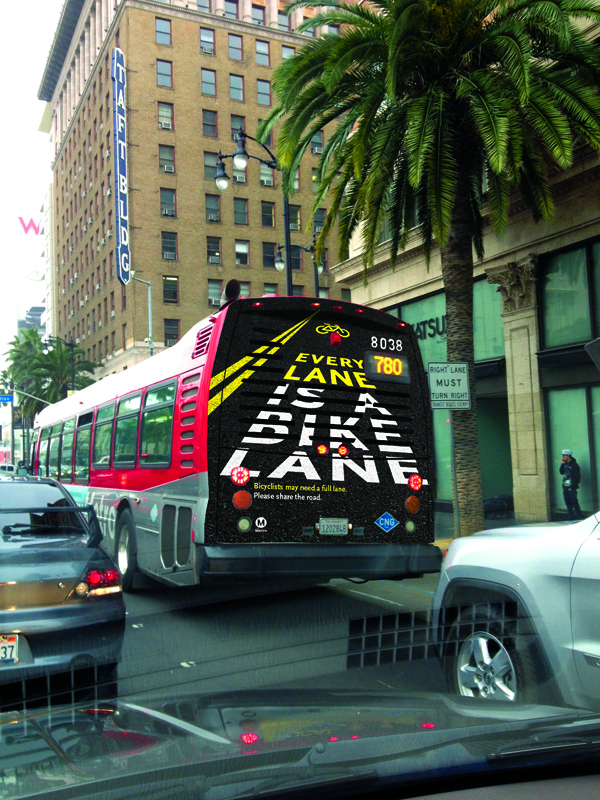 A project of Metro’s Creative Services and Marketing groups, the 'Every Lane is a Bike Lane' campaign is just one in a longer list of bicycle directives to be implemented by the agency’s bicycle planning program directed at motorists to increase awareness of cyclists’ safety. To target drivers, Metro developed an ad campaign to reach drivers on the roads and in their cars – on bus backs, billboards, drive-time radio and all across Los Angeles County. The bike safety message will also appear on bumper stickers to be handed out at bicycling community events. The campaign is based on research of bicycle safety campaigns suggesting that the approach that has been the most successful is to treat bicyclists and motorists equally, promote cooperation and emphasize safety without showing cycling as reckless or dangerous. Since the campaign’s launch in late March, Metro has received many positive comments. Dozens of cyclists have called and emailed Metro to thank the agency for the campaign. The campaign is scheduled to run through mid-May, ending just prior to Bike to Work Day. Bike Safety campaign on a Metro bus. The message appears on buses throughout Los Angeles County. Where’s the campaign that says bicyclists that choose to ride in lanes with other cars, that they need to signal, stop at red lights and stop signs and ride in the same direction as traffic? I used to never have problems with other cars when I was a bicycle commuter, but as a motorist, I am Constantly having near misses with bicyclists riding the wrong way, through red lights and stop signs. Darienn: There have been many PSA campaigns urging safe and legal riding on the part of cyclists. LADOT produced an ad a few years ago that covered precisely the behaviors (failure to obey traffic lights, not signaling, riding against traffic) you complain about. Unfortunately, it doesn’t appear to be online. Trust me, there is no shortage of public scolding of cyclists out there. The problem is that non-cycling drivers take these examples of poor behavior by individual cyclists and snowball them into disrespect for the rights of cyclists in general. This is unfair to people like me who strive to obey the law while exercising their right to use public roadways (including using a full lane when necessary for safety). We’re all our own individuals, and we’re each individually responsible for our own behavior and nobody else’s. We should strive to respect each other’s rights as legal road users despite the frustration we may feel when we observe some individuals breaking the law. This, in part, is what Metro’s ad campaign is all about. I should emphasize that a major reason for this campaign is that people on bikes — who are riding in a lawful manner and doing absolutely nothing wrong — are sometimes met with aggressive, threatening behavior from motorists when they elect to use a full lane of traffic. This pattern of harassment, which anyone who’s spent significant time riding LA’s streets can tell you about, is just as dangerous and just as much of a problem as the misbehavior of scofflaw cyclists is. It demands the attention of the largest transportation agency in LA County. Thank you Metro. You make my day easier as a cyclist, and that is why I ride your buses when I’m not cycling. Hopefully motorist will take note. Thank you for spreading the knowledge! When are cyclists going to pay DMV license fees to use our roads? They did in the 60s. It could be a huge revenue generator. We don’t just ride bikes, we also have cars and do pay DMV license fees already. DMV fees would not be a huge revenue generator if they reflected each bicycle’s wear and tear to the road compared to motor cars and trucks. Motor vehicle registrations change hands with sale of used vehicles. The bureaucracy to keep up with many, many millions of low fee bicycle registrations would probably lose money. Well said Naill! They is always someone who online who somehow missed all the previous parts of this ongoing effort. The idea is to promote traffic harmony with these campaigns. This one seems to be getting traction as it makes such a good point. I think it’s the best one by far.